If you’re a frequent sufferer of headaches or migraines, you’ll know just how debilitating they can be. Migraines and headaches can be brought on by all manner of conditions: noise, medication, allergies to foods, physical exertion – for some people even changes in the weather can bring on an attack. In this manic world we live in, one of the most common causes of headaches and migraines is stress and anxiety. When you’re stressed you unknowingly hold tension in certain areas of your body. Holding tension in your jaw, clenching or grinding your teeth, as well as hunching or rounding your shoulders, are all potential causes of headaches and migraines. In the past, I’ve known migraine-prone colleagues who’ve had to pull over on the hard shoulder of the motorway to be sick, and others who’ve had to swear off red wine, caffeine, or chocolate because they bring on an episode. Migraines and headaches are not easy to live with, but the good news is reflexology can help to relieve your suffering. Reflexology promotes blood circulation and optimises neurological (brain) function. Treatment releases muscular tension throughout the body and will leave you feeling more balanced, and therefore more able to cope with stress and anxiety. Regular holistic reflexology treatment can reduce the likelihood of headaches and migraines. When I treat a client specifically to relieve headaches and migraines I focus on the pressure points that correspond to the brain, head, neck, spine and solar plexus. Your big toe, the head reflex, is one of the key areas. Applying pressure here sends messages to the head and brain to relax. If your sinuses are the cause of your headache, I’ll focus on parts of your toes that correspond to this area of the face – the nerve clusters located close to your sinuses and the area just above your eyebrows – to alleviate symptoms. Applying pressure to the side of the foot (the spine) sends messages to every part of the spine to relax. Holding tension in your back and shoulders is another very common cause of headaches and migraines. Releasing tension here will help to relieve stress and tension in your head. 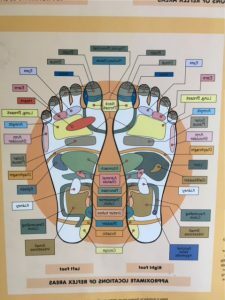 If you regularly suffer from pain in just one side of your head, treating the opposite foot with reflexology is more likely to relieve the pain. The pressure points to relieve headaches and migraines can also be found in the hands. By learning where your pressure points are, and how to apply the correct technique, you can alleviate pressure and prevent your headache taking hold. This is really helpful if you feel a headache or migraine coming on at work or whilst you’re out and about. I’ll happily show you how to do this during your reflexology session with me. Reflexology treats the whole body. With regular treatments, clients find their migraines and headaches become less frequent as their body becomes more balanced and relaxed. 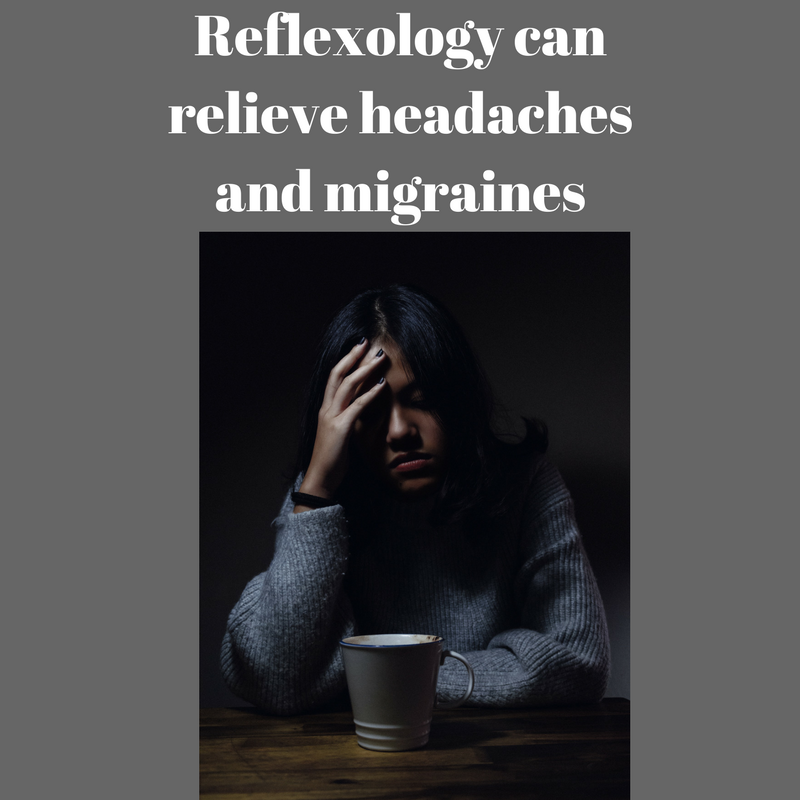 If you can relate to this post and you’d like to try reflexology treatment to be free from headaches and migraines, please get in touch for a chat .